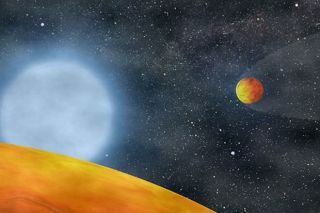 An artist's view of the two Earth-size planets orbiting a star at the end of the star's evolution, a set-up like that around the red dwarf star KIC 05807616. When the star expanded as a red dwarf, a gas giant spiraling inward removed much of its outer shell, but was torn to pieces in the process. A massive alien planet that may have been ripped into Earth-size chunks by its dying parent star is offering a unique glimpse into the evolution of other worlds and their stars, scientists say. The planet's two remaining pieces, which researchers tentatively identified as planet-size objects just slightly smaller than Earth, were possibly created when their parent body spiraled inward too close to the bloated red giant star KIC 05807616. Extreme tidal forces then tore the parent planet into pieces, some of which seem to have stabilized in orbit around the star, revealing that a planet's life doesn't always start and end neatly, researchers said. "Planets can still evolve, by disintegrating to several small bodies, or by being completely destroyed," authors Ealeal Bear and Noam Soker, of the Israel Institute of Technology, told SPACE.com by email. Once a common star like the sun, KIC 05807616 swelled into a red giant as it reached the end of its life. The gas surrounding it ballooned outward, engulfing any alien planets that lay too close. But one gas giant may have escaped complete destruction. By spiraling in through the star's shell, the planet's massive girth would have allowed it to function the same way a companion star might, stripping off the excess gas and allowing the star to contract to a more manageable size. At the same time, tidal forces would have ripped the giant planet to shreds, creating at least two rocks only a little smaller than Earth. Known as KOI 55.01 and KOI 55.02, the two planets orbit the sun between 550,000 and 700,000 miles (900,000 to 1,100,000 km), far closer than Mercury, and too hot to hold water on their surface. While much of the giant planet flew into space — or into the star — other pieces may also have been caught in orbit. When KOI 55.01 and KOI 55.02 were first identified, the presence of a third was also tentatively noted. If other pieces are found, it would strengthen the idea that the two rocky planets formed from a single object. But other planets throughout the galaxy may play a role in their stars' evolution. The authors emphasized that there are more indications for planets existing around dying stars, calling the pairing "a general process that we expect to take place in other circumstances," Bear and Soker said. They intend to continue monitoring new discoveries of planets around evolved stars, analyzing possible evolution routes to explain their existence. The researchers' findings are detailed in the April edition of the Astrophysical Journal Letters. When the extrasolar planets around KIC 05807616 were initially discovered in December, their location near the star surprised astronomers. "Before this discovery, the consensus was that planets simply cannot influence the evolution of their parent star, and cannot survive being swallowed by a red giant star," Stephane Charpinet, of the University of Toulouse in France, told SPACE.com in an email. Charpinet was the lead author on the paper that first identified the potential planets. Using NASA's planet-hunting Kepler spacecraft, Charpinet and his team noticed periodic dimming around the dying star. After analyzing the data, they concluded that the changes were caused by two planets zipping around the star. They initially suggested that the rocky bodies could have started as two gas planets whose atmospheres were torn away as they demolished the outer layers of the star. "We were hoping that other groups would jump on this discovery and propose their own ideas, or refine our interpretations on the subject," Charpinet said. "We are glad that this happened quite rapidly, as Ealeal Bear and Noam Soker proposed this truly interesting alternative to our scenario."